An opportunity was identified for a joint project to develop a purpose built waste water treatment plant near the refinery which could then utilise the recycled water. In the mid-1990s, Barwon Water began developing a long term sewerage strategy to manage future growth in Geelong. Around the same time, Shell Geelong Refinery (now Viva Energy) was considering ways to improve the quality of its wastewater and reduce use of drinking water. An opportunity was identified for a joint project to develop a purpose built waste water treatment near the refinery which could then utilise the recycled water. The ‘Northern Water Plant,’ as it has become known, has provided a win-win solution for both Barwon Water and the refinery. After several years in planning, construction commenced in April 2011 and the project was officially opened in April 2013. 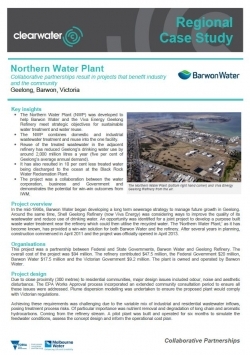 The Northern Water Plant (NWP) was developed to help Barwon Water and the Viva Energy Geelong Refinery meet strategic objectives for sustainable water treatment and water reuse. The NWP combines domestic and industrial wastewater treatment and reuse into the one facility. Reuse of the treated wastewater in the adjacent refinery has reduced Geelong’s drinking water use by around 2,000 million litres a year (five per cent of Geelong’s average annual demand). It has also resulted in 10 per cent less treated water being discharged to the ocean at the Black Rock Water Reclamation Plant. The project was a collaboration between the water corporation, business and Government and demonstrates the potential for win-win outcomes from IWM. Federal and Victorian Governments, Barwon Water, Geelong Refinery. The overall cost of the project was $94 million. The refinery contributed $47.5 million, the Federal Government $20 million, Barwon Water $17.5 million and the Victorian Government $9.2 million.